Aurora Water uses the Arkansas River at Canon City gage to represent contributions from the Arkansas Basin to its water supply. In 2004, Connie Woodhouse developed this reconstruction of the Arkansas River at the request of AMEC Earth & Environmental (formerly Hydrosphere), consultants for Aurora Water. Because the model was calibrated prior to the updating of a key chronology (Van Bibber) that ends in 1987, the reconstruction only extends through 1987. Given the chronologies currently available, this reconstruction could be re-calibrated and extended through 2002. A forward stepwise regression procedure was then used to calibrate the observed flow record with a pool of potential predictors consisting of tree-ring chronologies from Colorado. Five chronologies were selected by the stepwise procedure for the reconstruction model. Validation statistics were computed using a leave-one-out (cross-validation) approach. Figure 1. 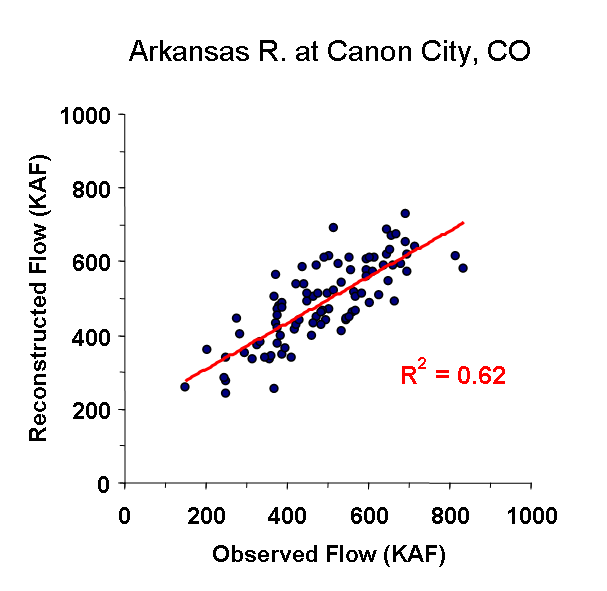 Scatter plot of observed and reconstructed Arkansas River annual flow, 1896-1987. Figure 2. Observed (gray) and reconstructed (blue) Arkansas River annual flow, 1896-1987. The observed mean is illustrated by the dashed line. Figure 3. Reconstructed annual flow for the Arkansas River (1685-1987) is shown in blue. Observed flow is shown in gray and the long-term reconstructed mean is shown by the dashed line. Figure 4. The 10-year running mean (plotted on final year) of reconstructed Arkansas River flow, 1685-1987. Reconstructed values are shown in blue and observed values are shown in gray. The long-term reconstructed mean is shown by the dashed line.